HDMI Forum has released Version 2.1 of the HDMI Specification, which is now available to all HDMI 2.0 adopters. This latest specification, which was first announced in January, supports a range of higher video resolutions and refresh rates including 8K60 and 4K120, and resolutions up to 10K. Dynamic HDR formats are also supported, and bandwidth capability is increased up to 48Gbps. Supporting the 48Gbps bandwidth is the new Ultra High Speed HDMI Cable. The cable ensures high-bandwidth dependent features are delivered including uncompressed 8K video with HDR. It features exceptionally low EMI (electro-magnetic interference), which reduces interference with nearby wireless devices. The cable is backwards compatible and can be used with the existing installed base of HDMI devices. 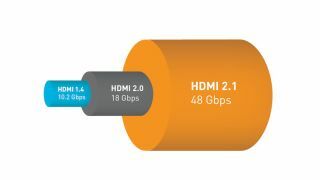 Version 2.1 of the HDMI Specification is backward compatible with earlier versions of the specification, and was developed by the HDMI Forum’s technical working group, whose members represent some of the world’s leading manufacturers of consumer electronics, personal computers, mobile devices, cables, and components. Dynamic HDR support ensures every moment of a video is displayed at its ideal values for depth, detail, brightness, contrast, and wider color gamuts—on a scene-by-scene or even a frame-by-frame basis. Auto Low Latency Mode (ALLM) allows the ideal latency setting to automatically be set allowing for smooth, lag-free, and uninterrupted viewing and interactivity.